As young children we learned about mythical animals that possessed supernatural powers. Most of these animals resulted from the folklore of centuries past; folklore whose intent was to scare mere mortals or to attempt to explain natural happenings in our universe. In recent years, however, these folklore stories have still been told, but instead, the intent is more often to entertain the reader or listener, rather than to explain the universe or to create fear and respect. In the case of the genus Naso, its species were awarded the common name, Unicornfish, because of the single protrusion extending from their head- much like the single horn found on the mythical animal's forehead. The comparisons, however, end there, as these fish do not have the hindquarters of an antelope or the tail of a lion. Grab your favorite blanket and curl up into bed or gather 'round the campfire - the tale of the Unicornfish is about to be told. The largest of all Naso species is the White-margin Unicornfish, also called N. annulatus. An adult can reach up to three feet in length. 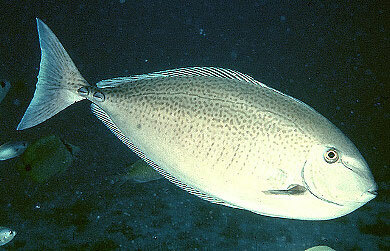 Juveniles generally remain as solitary fish and lack the namesake horn of the genus. Adults are easily distinguished by the large horn, and they often remain in schools as they cruise the reef wall. Photo courtesy of John Randall. As Surgeonfish, all Naso tangs are found in the family Acanthuridae, which consists of three sub-families, six genera and seventy-two species (Michael, 1998). All species possess at least one, and possibly three or more, potent weapons just forward of the base of their tail, on an area known as the caudal peduncle. These weapons are similar to daggers and consist of modified scales. Extensive tests have not conclusively shown any sort of venom to be associated with these knife-like spines, but it is important to note that in one series of observations, every fish cut with the dagger of modified scales from members of the sub-family Prionurinae died as a result of the wound (Baensch, 1994). Luckily for us, fish from the sub-family Prionurinae rarely make it into the hobby. Ichthyologists use the caudal peduncle as a distinguishing characteristic to place each member into one of the three sub-families. 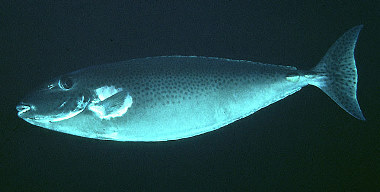 In all three sub-families the dagger is attached most closely at the base of the tail, and extends toward the front of the fish. With most species having two spines in their caudal peduncle, Naso species are placed in the sub-family Nasinae. However, three species in the genus have a single spine in the caudal peduncle. This deviation from the norm of the genus warranted the creation of a sub-genus. Originally, the subgenus began as a valid genus named Axinurus (Cuvier, 1829), but historically only one other author (Smith, 1951, 1966) has recognized this genus as valid. When Randall (1994) reviewed the three species of Axinurus he decided that the characteristics Cuvier used to erect the genus were insufficient to warrant being a genus, and reduced Axinurus to a subgenus of Naso. Smith (1955) is also responsible for naming another genus within the subfamily Nasinae when he assigned two Naso species to the newly erected genus Atulonotus. In his 1966 review of Nasinae, however, Smith utilized a total of three genera in the Nasinae subfamily: Naso, Axinurus, and the monotypic genus Callicanthus. It was at this time that Smith also emended his description of Atulonotus and placed it as a subgenus. Tyler (1970) disagreed with Smith, and in his osteological review of the Acanthuridae family he named only a single genus under Nasinae - Naso. It is important to note that these variations in taxonomy are based on skeletal and other morphological features. If some researcher looks at the relationships as determined by their genetic similarity, it is likely that the relationships will change yet again. 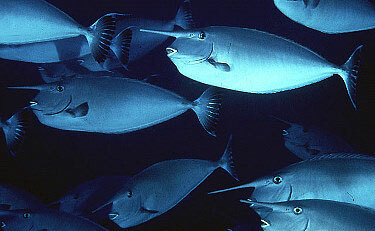 The Horse-faced Unicornfish acquired its name due to its short, rounded horn that develops on the adult fish. As shown in the photo, this is a full-sized horn which develops in this species. Naso fageni is fairly uncommon in the wild and rarely shows up in the aquarium trade. Photo courtesy of John Randall. Naso species differ from other Acanthurids by having fixed peduncular plates (in most Acanthurids the peduncle plates are retractable) and three pelvic fin rays. Additionally, they are noted to have highly specialized skeletal features not present in any other Acanthurids. Another distinguishing characteristic is their single, short-height dorsal fin, which originates near the head and extends the length of their body. Slim and pointed teeth number between 60-80 per jaw, depending on the species and age of the fish. A total of 19 species are now placed in the Naso genus. Naso species are wide-ranging fish that are distributed throughout most of the Indo-Pacific region. From the east coast of Africa to the Hawaiian Islands, north from southern Japan and as far south as the southern edges of the Great Barrier Reef, Naso species have certainly made their presence known throughout the Indo-Pacific. Having pelagic eggs and an extended larval phase undoubtedly accounts for their vast distribution. Most of the species can be found in water as shallow as 15 feet, and still others have been observed at depths greater than 500 feet, but the majority of species prefer steep drop-offs and reef walls occurring in the 40 - 120' range. The steep drop-offs offer them easy access to the pelagic environment. They are open water swimmers and most of the species have a silver-blue color, presumably a camouflage trait, which helps them disappear into the abyss against the background of open ocean. Additionally, they have a unique scale design, similar to that of sharks, which allows for greater speed and easy swimming by reducing the turbulence of water flow around the fish. The tough skin created by their unique scale design was taken from the fish that were harvested as food and used by native Hawaiians of the past as drumheads. The pelagic environment is utilized only by adults, most often in large schools, as they forage for zooplankton. As juveniles, they generally remain close to the reef structure and are found by themselves or swimming with other unrelated species, with the exception of the schooling and pairing of similar species by larger adults. Not only does the reef structure provide protection for the young fish, it also provides food. Juveniles are, for the most part, strict herbivores, cleansing the rockwork of algae at a frightening pace which allows for explosive growth of the fish. As the fish grow their diet slowly begins to shift until the adults feed primarily on plankton. In one particular gut analysis (Smith, 1951) algae were undetectable, and as he stated, the gut contents were "always a 'mush,' plainly animal tissue." With a distribution restricted to the Hawaiian Islands, Japan, the Coral Sea and the Lord Howe Islands, Naso maculatus is perhaps the most geographically limited species of the genus. Toss in the additional fact that the Scribbled Unicornfish is a deep-dwelling species, often found in waters more than 300 feet deep, and it should be easy to understand why this fish will not show up in your local aquarium store with any regularity. Photo courtesy of John Randall. Sexual dimorphism occurs in the genus and in its simplest terms can best be described as males simply being larger. The horn-like projection, which gives the genus its common name, is larger on males, the streamers found on some species' tails are longer in males, and the males' caudal peduncles are always larger and more pronounced. Naso species have an amazing ability to change color almost instantly. 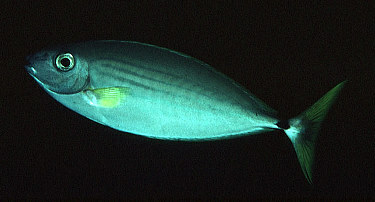 While foraging for food in open water Naso species adapt a color variation similar to many other pelagic fish - dark blue, or even green, shades concentrated at the top of the fish which slowly fade to a shimmering silver as the view changes to the midsection and finally merging into white on the bottom of the fish. 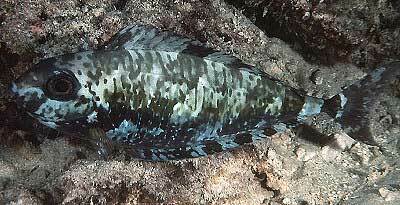 As the fish moves closer to rockwork or the substrate, the blue hues are traded for colors more like the substrate. Like so many other fish species, the males of the genus "flash" intense colors during courtship. When Naso species move into the cleaning zones of Labroides species wrasses they become entirely pale, presumably making the job of finding parasitic infections an easier task for the wrasse. Finally, the fish are able to darken completely in times of anger, fighting or aggressive behavior. The Humpback Unicorn, Naso brachycentron, acquired its common name by its humpback, which develops in both the adult male and female. 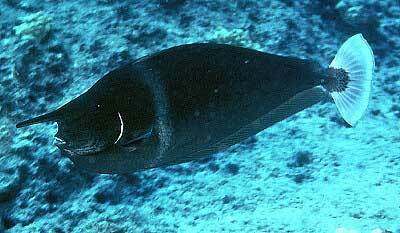 The fish in the photo is only beginning to develop its hump; hence it is just entering adulthood. 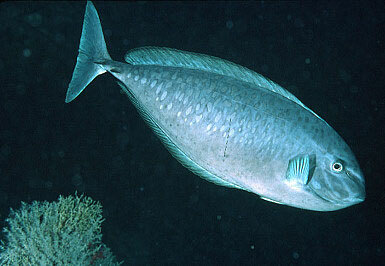 Additionally, this fish is a male as only males of this genus develop a horn. Photo courtesy of John Randall. 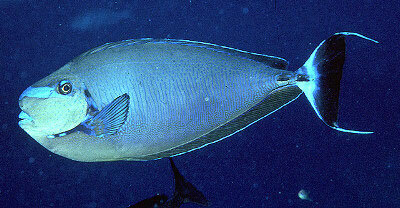 Unicornfishes are perhaps the hardiest of all Surgeonfish, and in this regard they make great aquarium inhabitants. After all, they are docile and fairly disease resistant. Their large size in conjunction with their preference for open water swimming, however, dictates their need for an incredibly large aquarium. Aquarium size is perhaps the largest obstacle to overcome when attempting to maintain a Naso species long-term. Small juveniles acclimate without problems in aquariums as small as six feet in total length, but if the aquarist's intention is long-term care, a six-foot long aquarium will be woefully inadequate. 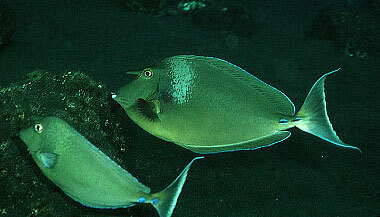 The One-spine Unicornfish is generally yellowish-green in its mid-torso region during daylight hours, but the photo shown here pictures the Naso thynnoides during the evening hours when it adjusts its coloration to hide among the rockwork. Photo courtesy of John Randall. What is known from keeping these fish in aquariums smaller than several hundred gallons is that the end result will be a fish with stunted growth. Additionally, the extent of the stunting is directly proportional to the aquarium's size. Following Choat and Axe (1996) and the understanding that Acanthurids obtain 80% of their growth in the first 15% of their life, you can get an idea of how fast they should be growing in your aquarium. Combine this with an expected life span of 35 years (Choat and Axe, 1996) and we come up with 80% growth obtained in the first 5.25 years. Let's take this a step further and plug in the expected maximum size for the popular Naso lituratus of 20". After doing the math you can readily see that Naso lituratus may reach 16 inches in length at 5.25 years of age. Following the same reference, which states that the first 80% growth is fairly consistent, it can be taken one step further: your Naso lituratus should be 3.2 inches long after its first year, and continue to grow three inches every year until five years of age, when its growth will slow and nearly stop, at which time it should be nearly ten inches long. This same formula can help to determine the age of a newly imported specimen. Keep in mind this additional point: Naso lituratus is one of the smaller Naso species. Some other species are capable of reaching nearly 40 inches in length. At this point you should be adequately prepared to determine if/when your Naso species has experienced stunted growth. The decision on how to handle this situation is up to you. Naso minor is the smallest of all Naso species, hence attributing to both the scientific name and the common name of Little Unicornfish. Their bland coloration has never attracted the interest of the aquarium trade, however. Photo courtesy of John Randall. In an aquarium large enough to house a Naso species, you undoubtedly will plan to have several tankmates in the aquarium. After all, a tank that large would look silly with only a single fish swimming around. The good news is that Unicornfish mix exceptionally well with most any other fish. They are passive and unassuming, but at times are perhaps slightly overwhelming to most smaller fish. Their large size and swimming agility typically concerns the smaller fish, but in due time even the smallest fish will learn that the Naso is not a potential threat. It would be wise to have small, passive fish well-acclimated to the aquarium prior to the Naso's addition. Larger fish typically mix with Naso's very well, almost to the point where it is not a concern. At times, it even seems like the Naso surgeonfish referee the fights of other fish, sticking themselves directly in the middle of the conflict in an attempt to break-up the fight. A juvenile Naso hexacanthus takes a moment to pose for the cleaner wrasse. Juvenile Sleek Unicornfish, as they are called by hobbyists and SCUBA divers alike, is pale blue throughout; the caudal fin becomes a darker, richer blue on adults. Additionally, adults grey-out or even adopt a greenish color on the remainder of the body except for the underside, which often develops a yellow hue. Photo courtesy of John Randall. Should be good tank mates. The docile Assessor will likely feel threatened by the large size and active swimming of the Naso. Should be good tank mates. Add Comet first. Although mixing is possible, Frogfish adapt to captivity better as lone inhabitants in the aquarium. Should be good tank mates. Add small gobies first. Avoid mixing a large grouper with a small Naso. Should be good tank mates. Add Jawfish first. Pipefish are best kept in a species dedicated aquarium. Seahorses are best kept in a species dedicated aquarium. Surprisingly, Naso species do well with other Surgeonfish. The Toadfish will attempt to consume the Unicornfish. Should be good tank mates with all but the fiercest Triggerfish. Note: While many of the fish listed are good tankmates for Naso species, you should research each fish individually before adding it to your aquarium. Some of the mentioned fish are better left in the ocean or for advanced aquarists. 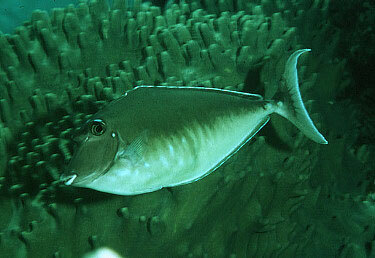 Naso lopezi, also called the Slender Unicornfish, remains widespread in the west Pacific Ocean, but rarely finds its way into a collectors net. Photo courtesy of John Randall. Invertebrates, both motile and sessile, are generally ignored by Naso tangs. On occasion, however, stories are told of a Naso species wiping out an entire crop of Xenia. Although this should not be regularly expected, it has been known to happen. On those rare occasions when this occurs, it seems the Naso tang and the Xenia shared the aquarium for a quite some time before the surgeonfish began feeding upon the soft coral. This is likely the result of a fish that was not receiving enough food. Hunger will force the best-behaved fish into taste-testing and consuming foods which it normally would not. Much like the Lipstick Unicornfish, Naso unicornis transmits a signal to warn possible threats that it will be a force to reckoned with. The blue spots surrounding the caudal peduncles undoubtedly gather attention from predators and divers alike and additionally have contributed to its common name - the Blue-spine Unicornfish. Photo courtesy of John Randall. Food offerings should change as the juvenile ages into adulthood. Like their wild counterparts, the juveniles should be offered a diet rich in algae. Various types of dried seaweeds, flake and algae-based pellet foods should be regularly available throughout the day. Their fast metabolism in conjunction with their active nature and their propensity for explosive growth dictate the need for a copious amount of food - yet another reason small aquariums are less than ideal for Naso species. Several feedings per day are almost certainly required. 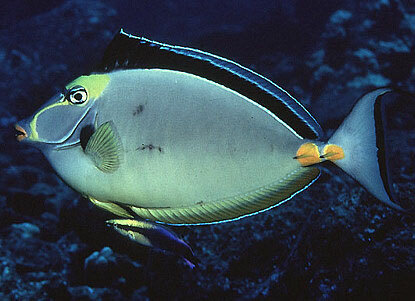 Additionally, you should expect the surgeonfish to enjoy grazing on any naturally occurring algae in the aquarium. Although Bryopsis and other types of "hair" algae are generally ignored, Caulerpa species are often relished, as well as Sargassum or Dictyota species. As the fish ages and continues to grow, however, the need to begin supplementing its diet with carnivorous foods will arise. Frozen/thawed plankton and Mysis species shrimp work very well for this purpose, but try to ensure a wide variety of foods to minimize the chance of nutritional deficiencies. Basically, expect your surgeonfish to eat just about any food that enters the aquarium, whether it is specifically intended for it or not. As is easily seen from the photograph, this fish is called the Silver-blotched Unicornfish. Scientifically referred to as Naso caesius, it often remains solitary as an adult or, on occasion, it will mingle with Naso hexacanthus. Photo courtesy of John Randall. Very few species of the genus are found in the aquarium trade with any regularity. This is due primarily to the excessive size reached by the majority of the genus' adult fish. By far the most popular member of the genus is Naso lituratus, also called the Orange-spine Unicornfish. Besides being perhaps the most attractive member of the genus, it is also the smallest, reaching up to only 20 inches in length. The majority of individuals imported for the hobby have their roots in Hawaii, despite the fishes' large geographical distribution in the wild. The Lipstick Unicornfish is the most commonly collected and purchased Naso species for the aquarium trade. Healthy adults of Naso lituratus will develop long tail streamers, which make for a truly spectacular display. Photo courtesy of John Randall. At a considerably higher price, aquarists can acquire the Indian Ocean Orange-spine Unicornfish. Ichthyologists have awarded this fish a distinct species name due to its limited geographic distribution and a slightly different color variation than its Pacific look-a-like. Unlike the widespread Naso lituratus, Naso elegans can be found only in the Indian Ocean and the Red Sea, a factor that obviously contributes to its inflated price tag. Overall adult size is similar in both species, however. This species has been long believed to be Naso lituratus, but the color differences, as well as their differing ray and teeth counts, warrant two separate species. Rivaling the beauty of Naso elegans is the Big-nose or Blue-lipped Unicornfish, Naso vlamingii. The large size of the adult is unfortunate because the striking beauty of the fish warrants much attention from aquarium aficionados, and it is regularly imported for the hobby. Photo courtesy of John Randall. 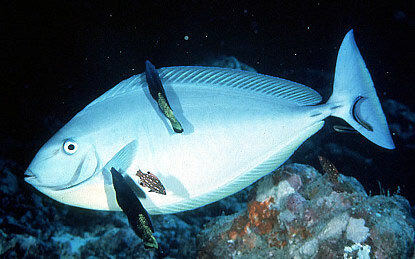 Vlaming's Unicornfish appears at fish stores only occasionally, but is common enough in the trade to warrant discussion. Referred to as Naso vlamingii by ichthyologists, this is perhaps one of the more aggressive species of the genus once acclimated to the aquarium. Like all other fish in the genus, adults typically remain 10 - 20 yards off the reef slope foraging on passing zooplankton, yet remaining prepared for a quick dash into the rockwork when predators appear. Oddly enough, none of the three aforementioned species has the distinct horn which has yielded the common name of the genus. It is, after all, not terribly common in the genus with only three of the species acquiring it with age - none of the juveniles has this spine. The Spotted Unicornfish, Naso brevirostris, is one of the three species which develop a very large spine and is perhaps the most attractive member of the trio. It isn't until the fish reaches 10 inches of length that the horn becomes apparent, but to acquire a show specimen with a large horn, a 20 inch adult would be needed; hence, none but the largest of show aquariums will be able to support a fish displaying this trait. The Spotted Unicornfish was so named due to the adult male fish that is spotted throughout its body, something which is only barely viewable in our photograph by looking closely at the front of the caudal fin. Naso brevirostris develops its horn at a much younger age than the majority of other Naso species. Photo courtesy of John Randall. Unicornfishes can be attractive additions to large home aquariums. Because of their peaceful disposition and outgoing personality, they regularly become the favorite finned inhabitant of hobbyists who maintain them. The only considerable drawback to acquiring Naso species is their large size, and the size of the aquarium required for the fish to obtain its natural adult size. Perhaps the purchase of a juvenile Naso is all that is required to seal the impending purchase of that dream-sized aquarium. The single caudal penduncle, as seen in the above photograph of Naso caeruleacaudus, designates this species as a member of the Axinurus subgenus. 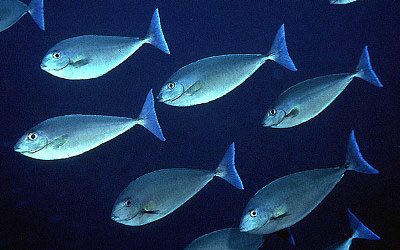 Due to their overall blue appearance, it has garnished the simple, yet effective, common name of Blue Unicornfish. If you have any questions about this article, please visit my author forum on Reef Central. Baensch, H.A. 1994. Baensch Marine Atlas, Volume 1. Microcosm. Shelburne. 1215 pp. Choat, J.H. and L.M. Axe.1996. Growth and longevity in acanthurid fishes; an analysis of otolith increments. Marine Ecology Progress Series; Volume 134, Issue 1-3, Pages 15-26. Cuvier, G. 1829. Le regne animal distribute d'apres son organization, pour server de base a l'histoire naturelle des animaux et d'introduction l'anatomie compare, ed 2, 2. Chez Deterville, Paris, France. Michael, S. W. 1998. Family Acanthuridae. 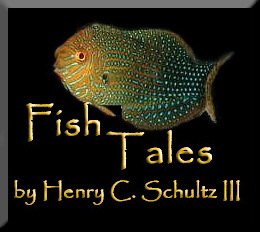 Reef Fishes Volume 1. Microcosm. Shelburne. 624 pp. Robertson, D. R. 1985. Sexual size dimorphism in surgeonfishes. Proc. Fifth Intern. Coral Reef Cong., Tahiti. 5: 403-408. Randall, J.E. 1994. Unicornfishes of the Subgenus Axinurus (Perciformes: Acanthuridae: Naso), with descriptions of a new species. Copeia 1994:116-124. Smith, J.L.B. 1951. Sexual dimorphism in the genus Naso Lacepede, 1802, with a description of a new species, and new records. Ann. Mag. Nat. Hist., ser. 12, 4:1126-1132. Smith, J.L.B. 1955. East African unicorn fishes from Mozambique. S. Afr. J. Sci. 51:169-174. Smith, J.L.B. 1966. Fishes of the sub-family Nasinae with a synopsis of the Prionurinae. Ichth. Bull. Dept. /ichth. Rhodes Univ., no. 32:635-682. Yasumoto, T., Hashimoto, Y., Bagnis, R., Randall, J. E., and Banner. A. H. 1971. Toxicity of Surgeonfishes. Bull. Japan. Soc. Sci. Fish. 37(8): 724-734.